Eurasion Water Milfoil (Myriophyllum spicatum) is the water weed of the moment, with many experiencing problems with this aquatic plant in their lakes and ponds. Also known as Spiked Water Milfoil this submerged aquatic plant lives in slow-flowing streams and ditches, as well as lakes, ponds and flooded gravel pits. 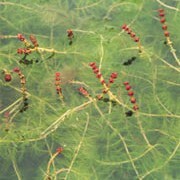 Its attractive, feathery leaves are held just below the surface of the water, but its tiny reddish flowers emerge on spikes during June and July. It provides shelter for many aquatic creatures and emerging stems offer places for dragonflies and damselflies to alight and lay their eggs. But Water Milfoil can over-take a body of water, and due its early spring growth can crowd out other native species. It forms dense mats which negatively impact on the ecology of the body of water, as well as interfering with recreational activities such as swimming, fishing, water skiing, and boating. Mechanical control works well with Water Milfoil, with dredging being the most effective means of removal. The cut material must be removed from the water to avoid de-oxygenation. The cut weed can be left to decompose in small heaps away from the side of the water, taking care to avoid seepage of the liquor back into the water. Disposal of large amounts should be taken to a recognised local authority tip or landfill site. The Aquatic Solutions team have the skills, knowledge and experience to tackle all Water Milfoil, as well as any other invasive aquatic plant. Using the amphibious Truxor vehicles they can easily access areas to work on the water, clearing aquatic weeds to a depth of 2 metres. The vehicles are lightweight and manoeuvrable, able to gain access to the most restricted areas of a water body while leaving minimal impact on the surrounding land. Read more about these incredible machines here. Take a look at some of our case studies which give examples of who we’ve worked with and the projects we’ve successfully undertaken. For assistance identifying any invasive aquatic plant, including Water Milfoil, take a look at our guide. If you’d like to talk to us about any aquatic plant problem, please contact us now to arrange a free informal discussion.